An overview of the game, it's theme and mechanics. I must say that I am impressed. Quite simply, this is a really good game. In a way it is the Inception version of a worker placement, a worker placement inside a worker placement game. Really it is more area control, but it feels something like worker placement inside worker placement. You start the game with blue prints that you are going to build to manage the areas you want to control. When you have the resources that you need you can use these blue prints and build the buildings to place on the board, each one offering a benefit of some kind. The board is broken up into five identical districts and victory points are awarded for how many buildings you control in a certain district. There are three types of workers that you can use to collect the resources that you need for your buildings. Elves are going to collect wood for you, dwarfs stone, and gnomes are special. They are like house elves from Harry Potter residing in the one building you place them in never to leave. But they will work in your building for different benefits. Other then wood and stone there are other resources that you can collect. Either of the two can collect gold to make purchases. And both together can mine for ore. There are also guilds that you can place on IN the city you are working to control that will give you an extra benefit above and beyond the work of a normal worker. But these are limited and usually go first in the round. Your own personal buildings that you build will also give you resource benefits and the last place you can collect resources is at the trader. At the trader you can swap a resource or two for another at a set ratio depending on what you want to trade. Turn order is a big deal in Belfort as it is in most worker placement games; you want that one spot before anyone else gets there. But there are some benefits that I think I will get to in the tips page. You can also create Super Elves and Dwarfs that will work twice as hard and bring you double the normal resources then a normal worker. •	The game offers some replayability by having different guilds that you can switch in and out to mix it up or add more interaction. •	The game offers a deep level of play with diverse strategy. Overall, This is not the game that you would play with your family or new gamers. It is going to be for avid to power gamers, which is most likely what appeals to me. I like that the game is deep enough that you can really sink your teeth into it. Just from what I have seen there are different paths that you can take and focus on that will lead you toward victory, and I really like that in a game. Played my first game of this tonight. Components: The components of the game are nice. Everything is printed on fairly thick cardboard and the game pieces are painted wood instead of the usual plastic pieces. It adds a nice touch. Basics: The basics of the game were fairly easy to learn. This game is a resource management and building game. Play is turn based with each player first placing there workers in various places on the board or on previously built structures,to gain abilities, gold, or resources. Players first choose, turnwise, which abilities to use by placing workers (elves or dwarves) onto the various ability markers and paying any costs associated with them. 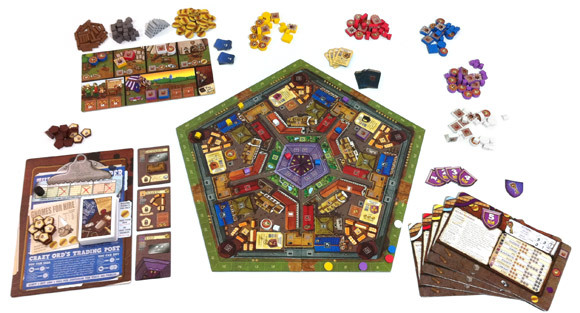 After all the players have chosen these, players then choose how much of what resources (wood, stone, or metal) to go after with their remaining workers. Play then progresses through each players turn as they harvest resources, activate their chosen abilities, or build buildings. Strategy: While the basic concept is fairly easy to grasp, strategy and long term thinking are key to winning this game. From the very first moment after choosing who goes first, strategy comes into play. Knowing which buildings to build, which guilds to use, and how to build on the board itself to generate the highest score is a must. Overall: Overall this game is easy to pick up but should provide enough depth of strategy to make it a long running favorite. I’ve played this game over a dozen times and it never gets old. I just love the theme and art, mechanics and verisimilitude, and my wife enjoys it to boot! > Worker placement melds really well with area control here (or vice versa). > Decisions aren’t always easy (there’s never one obvious move like in some games) but mistakes won’t usually ruin you. > Game concepts are simple enough to grasp that you can teach the game in the time it takes to set it up. > There can be some downtime if you have those AP players, but their decisions will affect yours so you will be paying attention. Plays great without the expansion, but the expansion does help with replay-ability and makes it even more complex. It removes a season from game play so it doesn’t add any time either. 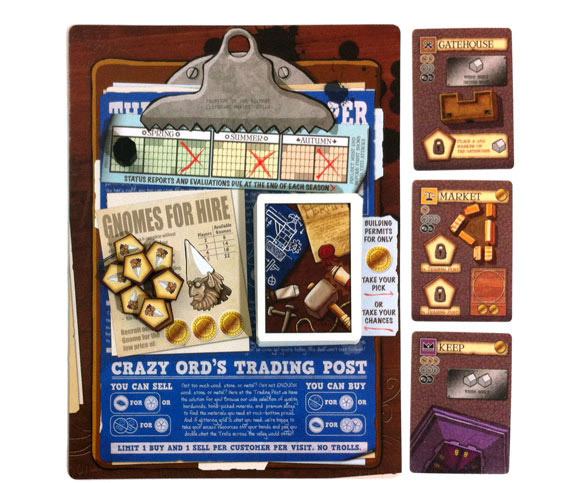 Players are given starting resources and building cards as well as a few workers each as the gnome and resource markets and the board are set up. Each round has three phases where the players will 1) place their workers, 2) take any resources their workers are collecting, earn income and pay taxes then 3) remove any remaining workers and take any necessary actions. The action phase is where the majority of the game is played with players gaining extra workers and resources, building their building cards, buying gnomes, taking additional building cards etc. Each time a building is built a player gets to place one of their house tokens on that building’s symbol in one of the five identical districts. Scoring takes place 3 times throughout the game with players scoring majority and minority house/district control as well as for the number of accumulated workers and the player with the highest score at the end of the game wins. This might get me clobbered here, but I have to admit, I’m not much into resource collecting games. It’s just not my thing. So why do I like Belfort so much? A big part has to be the way in which the different races are intertwined and represented. That part just clicked with me. I had flashbacks to 8-bit adventure games for some reason – cute and logical. I only got to play a few rounds at Gen Con, but I put this on my wishlist. Maybe it’ll change my mind about the whole game type. 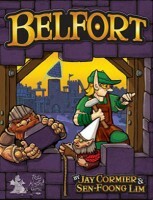 Add a Review for "Belfort"